Francona grew up in New Brighton, Pennsylvania, about 30 miles northwest of Pittsburgh, where he got his start in baseball at High School. His father is Tito Francona, who played in the majors from 1956 to 1970. In the 1978 Amateur World Series, Terry hit .350/.366/.550 as a DH-LF for Team USA, helping them to a Silver Medal. He tied Jae-bak Kim, Mitsugu Kobayashi and Graham Ward for 5th in the Series in hits (15) and tied Jerry Desimone for the most triples (2). Francona then was an All-Star outfielder with Team USA in the 1979 Intercontinental Cup, helping the club win Bronze. He attended the University of Arizona, where he played college baseball for the Arizona Wildcats baseball team. Francona and the Arizona Wildcats won the 1980 College World Series and he was named the tournament's Most Outstanding Player and won the 1980 Golden Spikes Award. He was inducted into the College Baseball Hall of Fame in 2011. Francona was selected by the Montreal Expos in the first round of the 1980 amateur draft and reached the majors in less than two seasons, when he was called up shortly after the 1981 strike with the Expos in a playoff race. Francona was drafted in the first round of the 1980 amateur draft by the Montreal Expos, using the 22nd overall selection. After briefly playing in the minor leagues, he made his major league debut with Montreal in 1981, a week after the end of that summer's player strike. He played often in the outfield during those first weeks, sharing time with Tim Wallach and Jerry White, although the veteran White got most of the playing time in the postseason. In 1982, after starting the year as a back-up, he became the starting left-fielder in May, when Tim Raines was moved to second base. He hit .327 in a month as a starter then seriously injured his knee on June 16th when he got his spikes caught in the warning track at Busch Stadium. He was out for the remainder of the season, and then hit poorly when he returned in 1983. He was hitting .217 without a homer on September 1st, then caught fire, batting .333 and slugging .550 over the last month. He went 4-for-12 in the National League Division Series against the Philadelphia Phillies, an extra playoff round utilized that year because the season was conducted in two halves as the result of the strike. As the seasons went on, Francona shifted to first base, where he ultimately played one hundred games more than he had in the outfield. He also developed a reputation as a contact hitter, with very few home runs, walks, or strikeouts. Francona's performance late in the 1983 season convinced the Expos to let Warren Cromartie leave over the off-season, and when 1984 began, Francona was the starting first baseman. His hot hitting continued, as he was battling for the National League batting title when a second major injury set him back significantly. He was hitting .346 with a league-leading 19 doubles when he twisted his knee trying to avoid a tag by John Tudor on June 14th. Once again, he missed the remainder of the season, but this time, when he came back in 1985, he was no longer the same player. First, his speed was gone, and second, his time of hitting well above .300 was over. Since he never had much power and did not draw many walks, his value as a player became limited, as his .267 average was coupled with an OBP of only .299. At the end of spring training the next year, he was released, finding a job as a back-up with the Chicago Cubs, where he hit .250 in 86 games in 1986. He was one of the players who replaced Pete Rose as first baseman of the Cincinnati Reds in 1987. However, his rival for the job, Nick Esasky, outhit him by a wide margin - Francona hit .227 - and he was no longer considered a potential starter after that. He played for the Cleveland Indians in 1988 then closed out his major-league career by playing 90 games for the Milwaukee Brewers in 1989 and another three games in 1990. Coincidentally, his father, Tito Francona, had also closed out his major-league career by playing for the Brewers, in their inaugural season of 1970. In 10 seasons and 708 games, he posted a .274 career average, with 16 home runs and 143 RBIs. He also made an appearance as a pitcher with Milwaukee on May 15, 1989, throwing 12 pitches and striking out one batter (Stan Javier) on three pitches. After retiring as a player, Francona began coaching, spending several years in the Chicago White Sox organization. In 1991, he managed the rookie league Sarasota White Sox of the Gulf Coast League. In 1992, he ran the South Bend White Sox of the mid-level Class A Midwest League. As manager of the AA franchise Birmingham Barons from 1993–1995, he posted a 223-203 record and won two distinctions: Southern League Manager of the Year in 1993, Baseball America's Minor League Manager of the Year in 1993, and top managerial candidate by Baseball America in 1994, the same year Michael Jordan played for Birmingham. Birmingham won the Southern League championship in 1993. He managed in the Dominican Winter League with the Águilas Cibaeñas, and he also won the championship and the Serie del Caribe in 1995–96. That team included Miguel Tejada, Manny Ramirez, and Tony Batista. Francona became third-base coach for the Detroit Tigers in 1996, working under their new skipper, Buddy Bell, a former teammate of his on the Reds. After the season ended, he was hired as manager of the Phillies, who had won the NL pennant in 1993 but then had three consecutive losing seasons. In his four seasons (1997 through 2000) as the Phils' skipper, the club never rose above third place in the National League East. His best finish with the Phillies was 77–85 in 1999. In 1998 and 1999, the Phillies finished in third place, behind the Atlanta Braves and their division-rival New York Mets. He was fired following the 2000 campaign, and spent the following season as a special assistant to the general manager with the Cleveland Indians in 2001, which was followed by two one-year terms as a bench coach for the Texas Rangers (2002) and Oakland Athletics (2003). He managed Team USA in the 2001 Baseball World Cup. 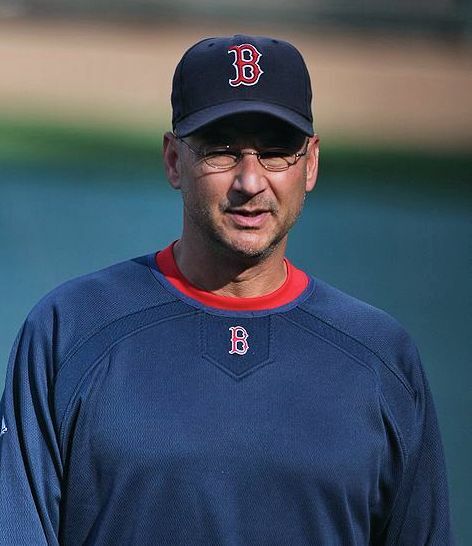 The Red Sox hired Francona to manage their club in 2004, after Grady Little's contract was not renewed following the Red Sox loss in the 2003 American League Championship Series. He led the Red Sox to a 98–64 record in 2004, the second-best record in the American League behind their biggest rival, the New York Yankees. The club gelled in the second half and won more games than any other team in the American League after the All-Star break.As the American League wild card, the Red Sox swept the AL West champion Anaheim Angels, three games to none, in the Division Series. In the 2004 American League Championship Series, the Red Sox fell behind the Yankees, three games to none, including a 19–8 loss in Game 3 at home in Fenway Park. However, the club regained its composure and won the last four games of the series, the first time in Major League Baseball history that a team rallied from an 0–3 deficit to win a playoff series (only the third team to even make it as far as Game 6, and the only team to even force a Game 7 after trailing a series three games to zero). The Red Sox swept the St. Louis Cardinals, 4–0, in the 2004 World Series, ending the so-called Curse of the Bambino. During the 2005 season, Francona was hospitalized after complaining of severe chest pains. Tests revealed significantly clogged arteries, but it was concluded that he had not suffered a heart attack. This incident, as well as a life-threatening pulmonary embolism suffered in 2002, ongoing treatment for blood clots, and painful knees, have led to circulation issues which necessitate wearing extra clothes, including two pairs of tights. This is also why his regular uniform top is usually hidden by a pullover. As of October 1, 2008, Francona's career regular-season managerial record was 755–703 (.518), while his post-season record was 22–9 (.710). Among managers who have managed at least 20 post-season games, he has the highest winning percentage. He was 7–0 in playoff elimination games until Game 5 of the 2005 ALDS, against the Chicago White Sox, when he became 6–1 and 9–0 in ALCS elimination games until Game 7 of the 2008 ALCS, against the Tampa Bay Rays, when he became 9–1. In 2008, the Red Sox announced that they had extended Terry's contract. Instead of expiring at the end of the 2008 season, it would expire after the 2011 season. The team also held club options for 2012 and 2013. Francona was guaranteed a total of $12 million over the first three years of the contract, plus a $750,000 buyout to be received if his 2012 and 2013 options were not exercised. 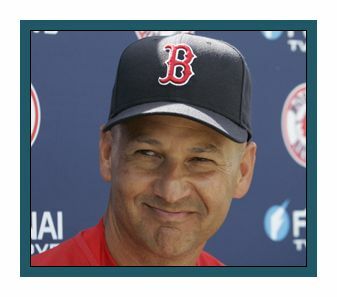 In 2010, he became the fourth person to manage 1,000 games for the Red Sox. In 2011, he got his 1,000th win as a manager. He became only the second manager in Red Sox history (after Joe Cronin) to accomplish this feat. Later that season, he presided over one of the worst collapses in the history of Major League Baseball when the Red Sox went 7-20 for the month of September and squandered a nine-game lead over the Rays for the AL Wild Card spot in the postseason. Following the season, the Red Sox declined to exercise his 2012 option. After spending the 2012 season as an analyst for ESPN, Francona was named the manager of the Cleveland Indians for 2013.